For the start of this lesson I wanted to show you how I transfer a drawing to my watercolor paper. I usually draw on a 8 x 10 or 9 x 11 sized drawing paper. Then, if the painting will be larger I have it enlarged to fit the watercolor sheet that I want to use. This piece will be transferred to a 10 x 14 inch Arches 140 lb. paper. 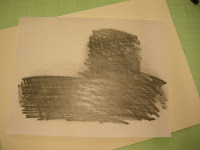 I scrub the back of the drawing with a Chunky graphite stick, which can be found at Cheap Joes (http://cheapjoes.com). I prefer the chunky graphite stick because it is huge, easy to scrub with, lasts forever and only costs about $2.00. When scrubbing the graphite on the back of your drawing, be sure to do this on a hard surface. Use some elbow grease. The more graphite you can deposit onto the paper, the easier it will be to gently transfer/trace the drawing onto your watercolor paper. Once the graphite is thickly applied to the back of the drawing, I gently rub it with a paper towel to remove any excess crumbs that could deposit themselves onto my paper. 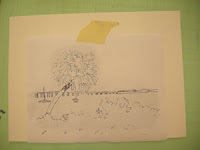 Then, I use masking tape to make a little hinge to hold the drawing in place. I also make a little pencil line from the drawing to the watercolor paper on two sides of one corner so that if I have to bring the drawing back to the watercolor paper for any reason, after removing it, I will have some marks to line it up against. 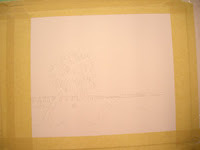 The tape hinge keeps the drawing in place while I trace, but allows me to lift it so that I can see my progress. You can use a pencil or a ball point pen to do the tracing. Be very gentle, though. If you press too hard you will make grooves in the watercolor paper and then, while painting, the pigment will settle into the grooves in an undesirable way.